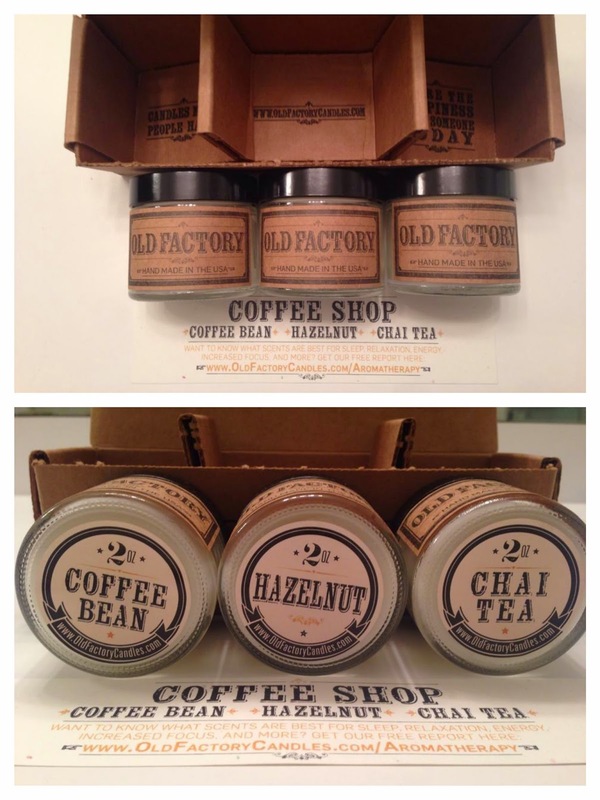 I'm So Polished: Old Factory Candles Review + GIVEAWAY! Hey everyone! I'm back from Florida and I had an amazing time. I'll be sharing some pictures from my trip on tomorrow's post. I have a candle review to share with you today. I LOVE burning candles, especially in the colder months. 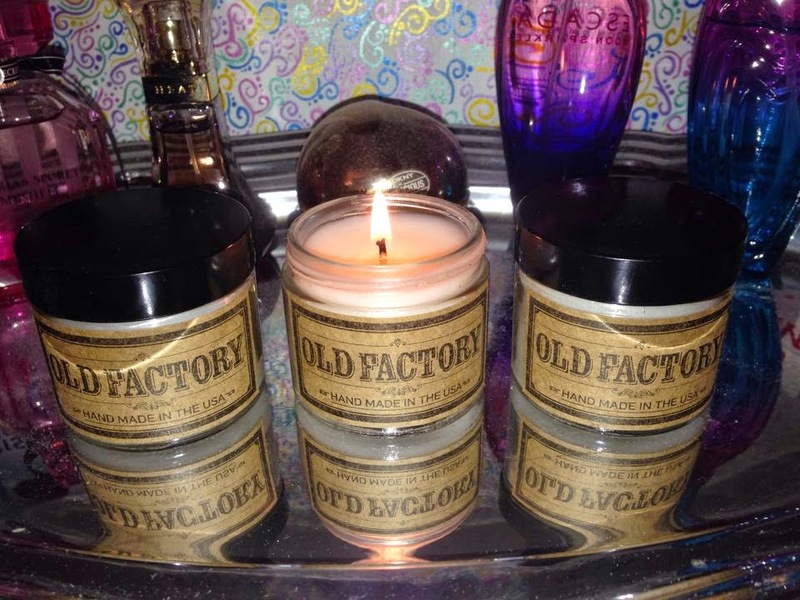 I know around this time of year everyone is all about the Bath & Body Works candles, but thanks to BrandBacker I had the opportunity to try Old Factory Candles. "Old Factory candles are hand-poured in the USA with natural soy wax, self-trimming cotton candle wicks, and premium fragrance oils. 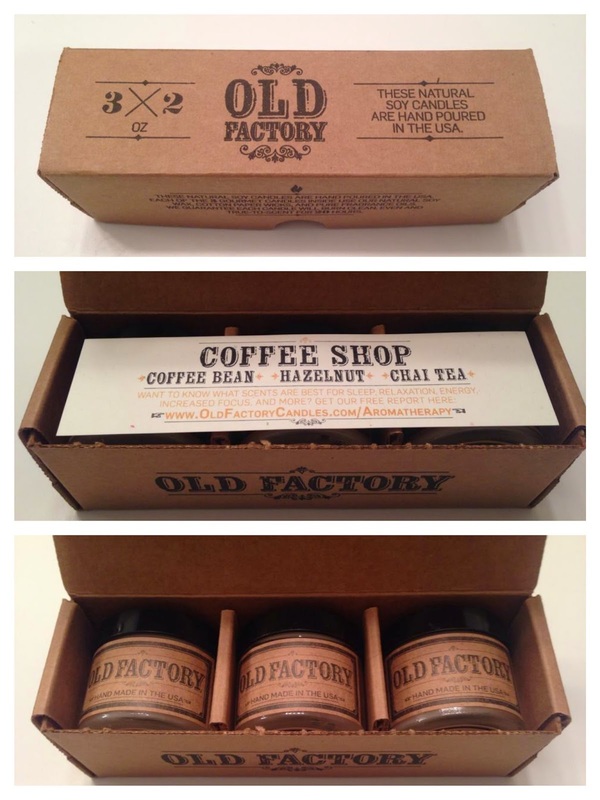 The Old Factory Candle Gift Sets each contain 3 different scented candles. Each candle burns clean and even for 20 hours. The subtle jar design makes it the perfect complement for any decor, and any room of the house - kitchen, bedroom, bathroom, family room, great room, and basement. Each gift set is themed around a group of related fragrances. So everyone is sure to find something perfect for every occasion, every room in the house, and all the special someones in your life. 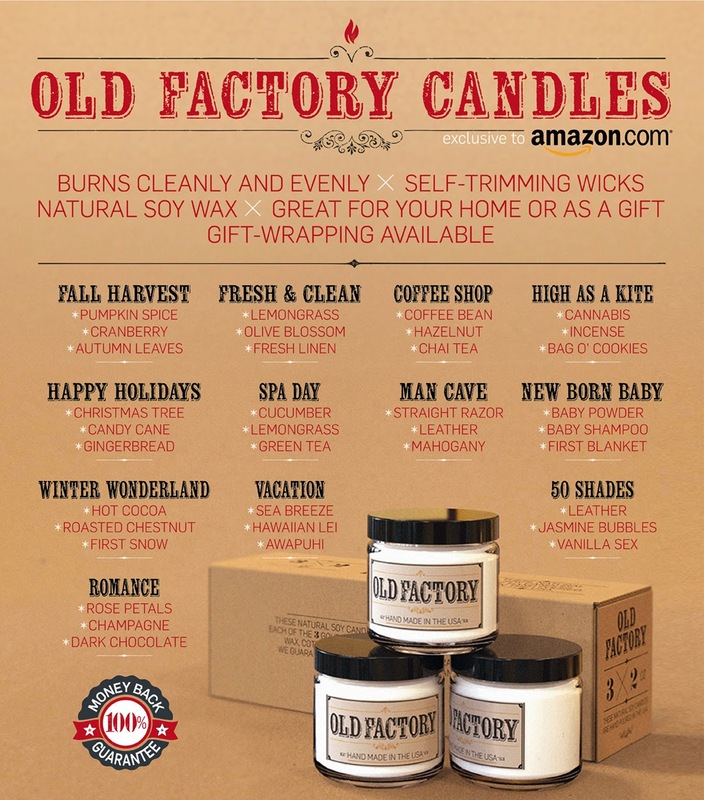 Old Factory Candle Gift Sets are sold exclusively on Amazon." When I received my candle set I was impressed by the packaging from the box to the labels. I opened the box and there was a card on top of the candles showing the name of the set and which scents are in the box. It took me a while to decide what to get, but I finally settled on Coffee Shop. This set has Coffee Bean, Hazelnut, and Chai Tea. These candles smell incredible when they are lit at the same time, but individually I would have to say my favorite is Chai Tea. The scent quickly filled my room and didn't give me a headache like some other candles tend to do. Overall I was super pleased with the experience! I placed the candles on my vanity with my perfumes and I love how they look. Old Factory has a huge variety of candle sets to choose from. The sets are priced at $25 each and gift wrapping is available. Shown below are the other candle sets that are available. I have Fall Harvest and Spa Day on my list! I definitely think there is something for everyone. Below I've provided the Amazon links to each candle set for your convenience. And now onto the most exciting part, the giveaway! One of you lucky readers will get a code that can be redeemed for a free set of candles of your choice from Old Factory. 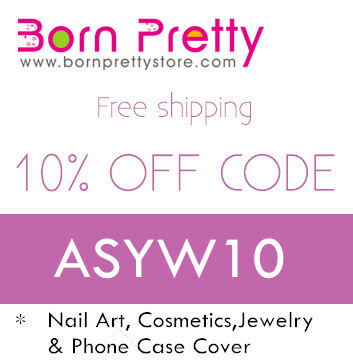 This giveaway is exclusively for U.S. residents. You must have an Amazon account and a PayPal account (unless you have Amazon Prime). The company will use Paypal to reimburse you for shipping. You can enter by using the Rafflecopter below. The only entry you must complete is telling me in the comments section which set you would choose if you won (I really want to know!) Each extra activity you complete will increase your chances of winning, although they are not mandatory. One winner will be selected at random. Contest ends 12:00am EST on 11/16/2014. You have one week for entry. Good luck! Disclaimer: This post was powered by BrandBacker. I received this product for free from Old Factory Candles in exchange for my honest review. I think I would get the romance set but a lot of them sound amazing! Thank you for the giveaway and chance to win and you did a WONDERFUL review linking to each set! I'll bet that dark chocolate candle in the romance set is diviiiine! Thanks for the kind words, good luck! I want to try Romance I think! It looks like an awesome set! Good luck! They all sound amazing, but I think I'd want to try Fall Harvest. Fall Harvest is one of their most popular sets :) Good luck! I think I'd go for Romance or Fall Harvest! Both sets look amazing, good luck! I would get either the romance or one of the winter sets. The winter sets are so festive! Good luck! I think that set would be super refreshing! Good luck! I mean, rose petals and champagne?! Doesn't get much fancier than that ;) Good luck! I'd go for the New Born Baby or Fall Harvest. New Born Baby looks like an interesting set. I wonder what first blanket smells like...good luck! The coffee shop set is amaaaazing! That's the set I have and I absolutely love it. Good luck! That gingerbread candle has been calling my name...good luck! I would say Fall Harvest for this time of year, but I'm loving the Spa Day set! I love candles and these look great; I'll be checking out their website. I think the Spa Day set would be lovely any time of year! As a candle lover myself I can honestly say that these are some of the best I've tried. Good luck! I love that they come in a set of three so you have a variety of scents to try. With so many options it definitely makes it hard to pick just one set! Good luck! I'd want the fresh and clean scent. Cotton and linen both smell amazing! The fresh and clean set has some really unique scents! Good luck! I want the coffee shop set! It's an awesome set! Good luck! The coffee shop ones with coffee, hazelnut and chai! Yum! The coffee shop set is amazing! Good luck! I would love the Fall Harvest collection of candles. I know they would smell wonderful. Thank you! The Fall Harvest set is next on my list, good luck! I think I would pick 50 Shades because I love jasmine. I also love vanilla. Don't judge! No judgement here! ;) Good luck! I would pick the coffee shop set!!!!!!!!! It's an awesome set, I've really been loving it! Good luck! Fall harvest or Happy Holidays - a very tough choice! Thank you so much for this giveaway, this sounds like an awesome company, too! Their candles really are wonderful, good luck!